“Yes I No,” a show by Sam Taylor-Wood, is currently on display at White Cube Gallery, in Mason’s Yard, London. 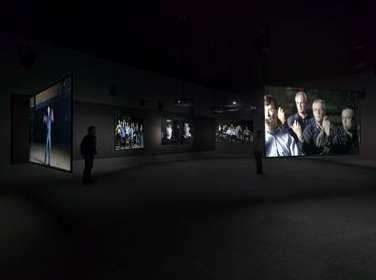 The show contains three sets of photographs, and a large-scale film installation. 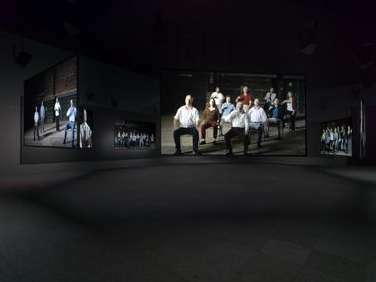 ‘Sigh,’ the installation, features the BBC Concert Orchestra playing a classical piece, without their instruments. 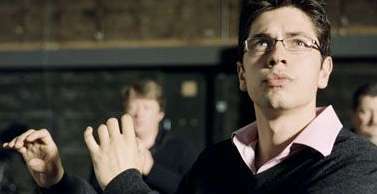 The orchestra members, who are filmed in plain clothes and in multiple takes and at various angles, are miming the performance, highlighting the relationship between the viewer’s aural perception of the music and the visuals of the musicians’ and conductor’s performing the music. Taylor-Wood, who rose to prominence in the 1990s along with Damien Hirst, Tracy Emin, and other members of the Young British Artists movement, is known for pieces exploring themes of absence and mortality. Sam Taylor-Wood was born in London in 1967 and has had numerous group and solo exhibitions, including the Venice Biennale (1997) and The Turner Prize (1998). Solo exhibitions include Kunsthalle Zurich (1997), Louisiana Museum of Modern Art, Humlebaek (1997), Hirshhorn Museum and Sculpture Garden, Washington DC (1999), Museo Nacional Centro de Arte Reina Sofía, Madrid (2000), Hayward Gallery, London (2002), State Russian Museum, St Petersburg (2004), MCA, Moscow (2004), BALTIC, Gateshead (2006), MCA Sydney (2006), MoCA Cleveland (2008) and Contemporary Art Museum, Houston (2008). This entry was posted on Saturday, November 22nd, 2008 at 4:08 pm	and is filed under Art News. You can follow any responses to this entry through the RSS 2.0 feed. You can leave a response, or trackback from your own site.